The pufferfish genome is 8 times smaller than the human genome, a fact that has been used by some to argue that most human DNA is unused junk. Humans also get about 100 mutations per generation. [[moran-2013]] Most mutations that have any effect on an organism are harmful. [[lind-2010]] If even 10% of DNA has a specific sequence, then humans and other mammals would receive almost 10 new harmful mutations each generation, causing all offspring to have more harmful mutations than their parents. [[ohno-1972]] [[gibson-2011]] [[moran-2014b]] Function would perpetually decline with each generation. If evolution can't even preserve the function in our DNA, it could not have created it. However if organisms were designed, it would not make sense to create them with non-functional DNA. Their only junk DNA would be that which has subsequently been destroyed by mutations. How much human DNA is in functional elements? This video[[dna-transcription-2010]] shows how DNA is copied (transcribed) into RNA. If at least 85% of DNA is copied to RNA, and at least 80% of those RNAs are taken to specific locations within cells, 85% * 80% = at least 68% of human DNA is used in a functional way. And likely much more because these are both lower-bound estimates. As function continues to increase as more DNA is studied, it is reasonable to think that perhaps even 99%+ DNA is in use. [[yong-2012]] This is not to say that every DNA letter within these sequences requires a specific sequence. How much human DNA requires a specific sequence of letters? Within a functional element of DNA, not all letters have to have a specific sequence. But how many do? If 85% of DNA is copied to RNA transcripts, 80% of those RNA transcripts are functional (transported to specific locations),[[mattick-2010]] and 66% of that RNA requires a specific sequence[[parker-2011]], then these three numbers multiplied suggests at least 45% of DNA requires a specific sequence. At least 20% of DNA consists of either specific sequences where proteins bind to it, or instructions for making proteins (exons)[[encode-2012]], and much known function that exists outside of protein binding spots and exons. About 95% of mutations that cause noticeable effects are outside of the 1-3% of DNA that creates proteins. [[maurano-2012]] [[freedman-2011]] From this (calculated below) we can extrapolate that at least 30% of DNA has a specific sequence. About 16% to 30% of either human DNA, or RNA copied from it, is shared (conserved) with distantly related mammals. [[smith-2013]] Distant enough that if we assume they evolved from a common ancestor, then mutations would have had enough time to scramble this DNA if it were non-functional. Since these are each under-estimates, and partially non-overlapping, the true amount of sequence-specific DNA is likely greater. The data on the amount of functional DNA nullifies the argument that almost all DNA is junk and is therefore not designed. Furthermore, at least 16-45% of DNA has a specific sequence, and likely much more. This implies humans get at least 16 to 45 harmful mutations per generation--far too many for evolution to even prevent declining function. Evidence is what is expected in one view and not expected in competing views. Therefore the large amounts of functional DNA is evidence that organisms were designed. The following sections outline this data in greater detail. Here, Michael Behe is merely formalizing an already widely accepted definition of functional elements. Sequence-Specific Function: These are nucleotides where a substitution mutation will alter the function or efficiency of a functional element, even if only very slightly. Sequence-specific function is a subset of the DNA that is in functional elements. Junk DNA: These nucleotides can be removed without degrading any functional elements. Other definitions are often used in the debate over how much DNA is functional, but most are less precise. Because most genome studies focus on the human genome this article does same, as there is the most data is available there. Binding: Columns 4-6. Regions of DNA that a protein binds to. Histone Marks: Columns 7-14. Histones are proteins that DNA is wound around within chromosomes. Histone marks are modifications that affect when DNA is copied to RNA. The third bar above (all RNA) shows that in 2012, at least 75% of DNA was found being copied to RNA. 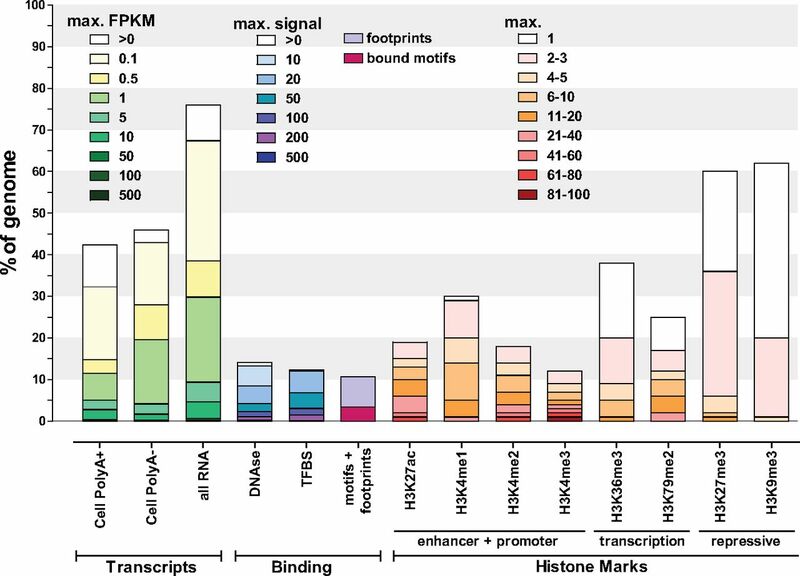 The tan regions in the first three bars corresponds to regions of DNA where about "one transcript copy per cell"[[kellis-2014]] was detected. Bars four through fourteen show the amount of DNA seen to be participating in other types of activity that implies function. Biochemical evidence: These blue regions show DNA that participates in the activities in the previous chart. Genetic evidence: This green region shows DNA that causes a noticeable change in function if modified. Evolutionary evidence: This red circle shows DNA that is the same in both humans and some distantly related mammals. Protein-coding: This purple circle shows DNA that is directly used to make proteins. Human development involves a single fertalized egg cell dividing into trillions of cells to eventually produce an adult human. These resulting cells come in many different types such as the various types of bone, muscle, and nerve cells. We see different cell types use different sections of DNA at different stages of development, in precise and reproducible patterns. John Mattick is a molecular biologist whose research focuses on non-coding DNA. Mattick directs the Garvan Institute of Medical Research and is a member of the Australian Academy of Science. Mattick is a proponent of evolutionary theory. If "transcription is fundamentally a stochastic process" as Graur argues, we should not expect transcription to be so precisely regulated. It's also notable that Mattick found this much function because "loss-of-function tests can also be buffered by functional redundancy, such that double or triple disruptions are required for a phenotypic consequence. "[[kellis-2014]] This means that many genes will not produce a noticeable effect when disabled, because when one gene is disabled, cells often automatically enable other genes to do the same job. If at least 85% of DNA is copied to RNA, and at least 80% of RNA transcripts are taken to specific locations within a cell, then we could estimate that perhaps 85% * 80% = at least 68% of DNA is within functional elements. And likely much more because these are both lower-bound estimates, not all DNA must be transcribed to have function, and not all RNA must be taken to a specific sub-cellular location to be functional. We also know that "the nucleic acids that make up RNA connect to each other in very specific ways, which force RNA molecules to twist and loop into a variety of complicated 3D structures. "[[garvan-2013]] This places many of the nucleotides transcribed to RNA in the sequence-specific category. Adding these gives 372 cross-linked nucleotides out of 566 total nucleotides, or 66%. From this we can make a lower-bound estimate of the percentage of nucleotides in functional RNAs that are sequence-specific: Since cross-linked RNA nucleotides require a specific sequence, this means at least 66% of the nucleotides within functional RNAs are sequence-specific. Although some of the others will be specific also. Above we estimated at least 68% of DNA is within functional elements. Multiplying this number by the 66% give us at least 45% of DNA being sequence-specific. The diagram above comes from a study looking at conserved DNA to find functional RNAs. Some may argue this introduces a bias, because RNAs with less specific sequences would be less likely to show up in a conservation study. 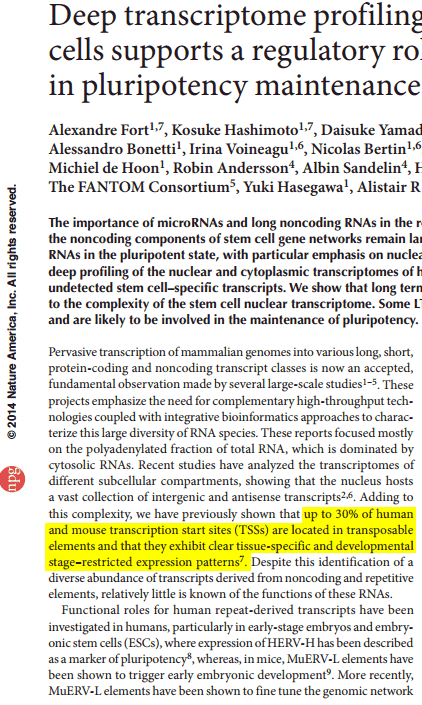 However compare those above to a functional RNA such as MiRNA-95, where "its conservation is limited to the primate lineage and a few other higher mammals"[[frankel-2014]] but has 60 out of 79[[hsa-mir-95]] (76%) cross-linked RNA nucleotides. From this we can estimate what percentage of DNA is subject to deleterious mutations. Within coding regions, a 2011 study[[freedman-2011]] found 79 non-synonymous and 26 synonymous function altering mutations. About 30% of protein coding mutations are synonymous. If synonymous nucleotides were as functional as non-synonymous nucleotides we should expect 30%*(26+79) = 31.5 of them to be function-altering. But only 26 of them are functional, suggesting that they are only 26/31.5=83% as functional as non-synonymous sites. If 2% of DNA is protein coding, and only 4.9% of harmful mutations fall within protein coding DNA, that means non-coding DNA is 2% / 4.9% = 41% as specific in sequence as coding DNA. Coding DNA is 71% sequene specific, so about 71% * 41% = 29% of non-coding DNA nucleotides are sequence-specific. Putting it all together: 2% * 71% + 98% * 29% = 30%. That means GWAS studies suggest at least 30% of DNA is sequence-specific. This is an under-estimate because mutations within non-coding DNA likely to have a smaller effect than mutations in coding DNA, and are thus harder to detect. [[mattick-2009]] Thus It is likely that even fewer than 4-5% of function altering mutations are within coding DNA. Are genome wide association studies unreliable? Of the 9184 GASs, 8733 (95.09%) and 5853 (63.73%) were mapped to at least one regulatory features, including promoter or enhancer, regulatory motifs, DNase footprinting sites, expression quantitative trait loci (eQTL) and conserved sequences, using the HaploReg and RegulomeDBdatabases , respectively. Moreover, many of these GASs were predicted to be associated with multiple regulatory features, suggesting their dynamic regulatory functions. Why do only a tiny fraction of nucleotides map to function discovered in genome-wide association studies? Human genomes are highly identical. Genome-wide association studies can only probe function where variation exists, and not enough genomes are yet available. Where variation does exist, multiple people with the same variation must be surveyed to rule out effects caused by environment, diet, or exercise. Most known traits have not yet been tested in genome-wide association studies. Many non-coding alleles exist in high copy numbers. A mutation disrupting only one of them would likely not show a phenotypic effect that would show up in a GWAS. Assuming common descent is true: If two distantly related organisms have some of the same DNA, it is likely functional. Because otherwise over tens of millions of years, random mutations in each species would have changed the DNA enough that it is no longer recognizable as similar. In other words: whatever mutated that DNA didn't survive. Such DNA is called conserved DNA, or DNA that is under selection. However, if organisms are designed and common descent is false, having sequences of DNA in common could also imply common design and therefore function. But without the assumption of common ancestry, shared sequences between not just distantly related, but all organisms would be used. Thus even the 95-96% of DNA shared between humans and chimpanzees[[preuss-2012]] would imply that 95-96% of DNA is sequence-specific. Some studies of conserved mammal DNA estimate lower amounts, but they do not take shape and RNA structure conservation into account[[rands-2014]], do not include lineage-specific conservation, or they were done before more mammal genomes were available for study. Furthermore, this is not to say that natural selection can actually maintain 16-30% of the DNA in a mammal. With this much function, harmful mutations would arrive faster than natural selection can remove them, as is described below in the Genetic Load section. Since these are each under-estimates, and partially non-overlapping, the true amount of sequence-specific DNA is likely greater. It is therefore very unlikely that all four are wrong and the amount of sequence-specific DNA is less than these numbers. A companion article, Predictions of Junk versus Functional DNA, goes into greater detail on the rationale and history of the predictions of junk DNA, the predictions of function made by intelligent design proponents, and catalogs prominent biologists who changed their minds. In typical populations of complex organisms, natural selection can only help spread or remove mutations that have a strong effect. Otherwise, random chance is the dominant factor in deciding which organisms reproduce and pass on their genes. This is not to say that mutations in almost all DNA would have no effect. The whole purpose of this article is to argue the opposite. If evolutionary theory is true, then most DNA in complex organisms must have no function because a highly neutral evolutionary process could create nothing better. Therefore large amounts of functional DNA is good evidence against evolutionary theory. Genetic load (also called mutational load) is the average number of deleterious (harmful) mutations per organism in a population. If the genetic load is too high, the population will not survive. By "genes," Ohno is referring to functional elements, not only protein coding genes. If evolution cannot even maintain these large amounts of functional DNA in complex organisms, then it could not have created it. Therefore large amounts of functional DNA is good evidence evolutionary theory is incorrect. This section addresses various objections to the idea that most of the human genome is functional. Some organisms have many times more DNA than others of similar complexity. Some argue that therefore most DNA in most complex organisms must be junk, and thus are not designed. This article provides data suggesting otherwise. Objection 2: "DNA that can be removed is junk"
Therefore removing a functional but redundant section of DNA will not have an effect on the phenotype. Another possibility is that the sequences removed were once functional but had previously been disabled by mutation in wild-type yeast. Objection 3: "DNA not conserved is not functional." Humans and mice have about 10% of their DNA in common (conserved). Humans and mice evolved from a common ancestor that lived about 80 million years ago. Since evolution is a very slow process,[[dodson-1962]] [[moran-2014]] it could not have created much additional function during those 80 million years. Therefore not much more than 10% of human and mouse DNA is functional. Objection 4: "Biochemical activity ≠ function"
If proteins bind to DNA largely at random then we would expect to see mostly weak binding. But we see mostly strong binding. Therefore most DNA-protein binding indicates function. DNA is usually copied to RNA in precise patterns depending on cell type and developmental stage. These RNAs are usually transported to specific locations within cells. When tested, these RNAs usually affect development or disease. 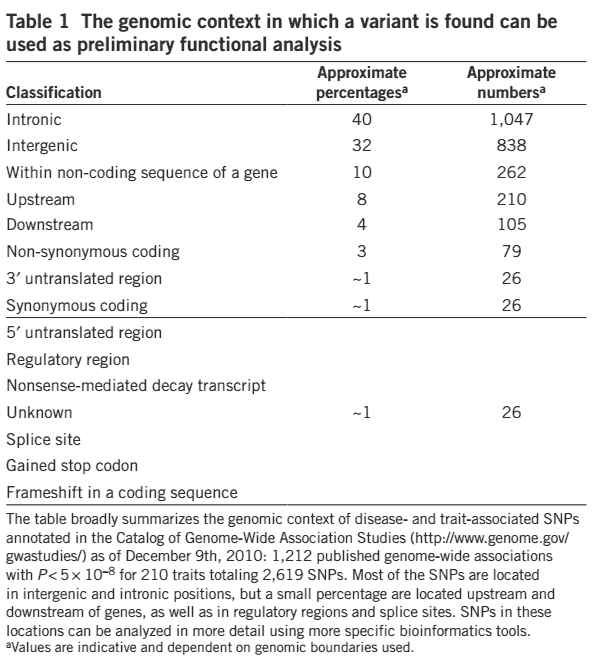 Genome-wide association studies (GWAS) find ~95% of disease/trait associated alleles are outside protein coding DNA. Objection 6: "Transposons co-opted active DNA"
About 44% of human DNA is made up of transposons and transposon-like repetitive DNA elements. [[mills-2007]] Some have argued that hundreds of millions of years ago, the genomes mammal ancestors were much smaller. Over time, transposons duplicated themselves throughout mammal genomes. Those that created copies of themselves within frequently used regions of DNA copied themselves faster than those that didn't. Therefore these transposons are only transcribed in developmental-stage and cell-type specific patterns because the DNA regions where they inserted themselves were already specifically regulated. Moreso, evolutionarily successful transposons would only need to integrate themselves into regions actively transcribed in germline cells (since that DNA is inherited), while integrations into actively transcribed regions in other cell types wouldn't matter. Yet we see these sequences being transcribed not primarily in regions active in germlince cells, but in all cell types. Thus this is also inconsistent with most transposon-like elements in our genomes originating from selfishly copying themselves. This idea of transposon co-option is also incompatible with other observations discussed above: transcripts are usually taken to specific sub-cellular locations, and when tested they usually affect development or disease. Objection 7: "Repetitive DNA (Transposons / ERVs / etc.) is junk"
In Why repetitive DNA is essential to genome function (Biol Rev, 2005), James Shapiro and Richard Sternberg identify over 80 roles for repetitive sequences. Micromanagers: new classes of RNAs emerge as key players in the brain (Science News, 2008) provides an overview of many known functions of non-coding RNA. That said, I can’t help but notice a trend: over time, 'junk DNA' is disappearing. Good riddance: this is just a term for DNA that we don’t have any guesses about its function. The more we learn about the genome, the more functions we uncover, thus fewer unknowns and a more seemingly 'useful' genome. Where will it end? I have no idea, but many people are looking (though more are always needed!). It's been my experience that anytime we have to quibble over a soft definition, we are missing a larger point. A better question would be, what percentage of the DNA sequence could be removed with ABSOLUTELY NO effect? I would guess that it's very, very small. That comment was later deleted. Biochemist and prominant junk DNA proponent Larry Moran also became involved in the discussion. In this thread from 2013, an ENCODE scientist defends the ENCODE conclusions in a debate with an evolutionary biologist. Five Things You Should Know if you Want to Participate in the Junk DNA Debate, 2013. Biochemist and ID critic Larry Moran outlines why he thinks most DNA is true junk. Most of his reasons are based on the idea that evolution couldn't have produced anything better. In December of 2014, well known genomicist and ID critic Dan Graur (cited frequently here) wrote a blog post about an earlier version of this article. [[pufferfish]]Fine, Steven. "Pufferfish at the Audubon Aquarium of the Americas" Wikipedia. 2016.Wikipedia says the image is licensed under the Creative Commons Attribution-Share Alike 4.0 International license. [[yong-2012]]Yong, Ed. "ENCODE: the rough guide to the human genome ." Discover Magazine. 2012. [[behe-2010]]Behe, Michael J. "Experimental evolution, loss-of-function mutations, and "The first rule of adaptive evolution." Quarterly Review of Biology. 2010. Michael Behe defines a "functional coding element" as "a discrete but not necessarily contiguous region of a gene that, by means of its nucleotide sequence, influences the production, processing, or biological activity of a particular nucleic acid or protein, or its specific binding to another molecule." [[eyre-walker-2007]]Eyre-Walker, Adam et al. "The distribution of fitness effects of new mutations." Nature. 2007 . The authors state: "relatively few amino-acid-changing mutations have effects of greater than 10% in humans, and that most have effects in the range of 10-3 and 10-1" Mutations in synonymous regions and non-protein coding genes would have even less of an effect. [[lind-2010]]Lind, Peter A. et al. "Mutational Robustness of Ribosomal Protein Genes." Science. 2010. The authors tested two ribosomal proteins in salmonella trphimurium and found: "most mutations (120 out of 126) are weakly deleterious and the remaining ones are potentially neutral." The authors did not detect any beneficial mutations. They suggest their study is more sensitive than others because "Mutagenesisstudies of single proteins rarely include the use of high-sensitivity assays of fitness and analysis of synonymous substitutions (SOM references)... it is conceivable that the relatively high frequencies of apparently neutral mutations observed in certain experimental systems are mainly a consequence of the limited sensitivity of the assays and that the proportion of deleterious mutations is very high even when synonymous substitutions are included." [[lynch-2006]]Lynch, Michael. "The Origins of Eukaryotic Gene Structure." Mol Bio Evol. 2006. Michael Lynch is a highly respected population geneticist. He writes: "The neutral (or nearly neutral) theory that emerged from this work still enjoys a central place in the field of molecular evolution" and "it is difficult to reject the hypothesis that the basic embellishments of the eukaryotic gene originated largely as a consequence of nonadaptive processes operating contrary to the expected direction of natural selection." [[myers-2014]]Myers, PZ. "The state of modern evolutionary theory may not be what you think it is." Pharyngula Blog. 2014. PZ Myers is a developmental biologist well known for his criticisms of Intelligent Design. Myers writes: "the revolution is over. Neutral and nearly neutral theory won." [[dodson-1962]]Dodson, Edward O. "Note on the Cost of Natural Selection." The American Naturalist. 1962. JBS Haldane was an evolutionary biologist well known for his work in developing the modern evolutionary synthesis. Calculating the implications of Haldane's model, Dodson explains: "Haldane (1957) has published calculations which indicate that it takes no less than 300 generations to replace a gene by ordinary selection pressures, and that this evolutionary process cannot be speeded up by simultaneous selection for more than one gene....we arrive at a maximum of something over 200 gene substitutions over the past million years for the genus Homo." Since on average the mutation rate is the fixation rate, 300 generations with about 100 mutations per generation would give 30,000 neutral mutations per 1 beneficial mutation that fixes. 29,999 / 30,000 is 99.997% of fixed mutatiosn being neutral. [[moran-2014]]Moran, Larry. Comment on "Breaking news: Creationist Vincent Torley lies and moves goalposts." Sandwalk Blog. 2014. Joe Felsenstein is a well known population geneticist who has published a criticism of Haldane's limit. When he and biochemist Larry Moran (both Intelligent Design critics) were asked to estimate the number of beneficial versus neutral differences between human and chimps, they replied: "Updated numbers suggest 44 million point mutations and something like 2 million insertions/deletions for a grand total of 46 million mutations. We don't know how many of those were beneficial (adaptive) leading to ways in which modern chimps are better adapted than the common ancestor. (Same for humans.) My guess would be only a few thousand in each lineage." 1 - 3000 / 23,000,000 is 99.987% of fixed mutations being neutral. [[meader-2010]]Meader et al. "Massive turnover of functional sequence in human and other mammalian genomes." Genome Res. 2010. Figure 2 shows how much DNA (of 3 billion base pairs total) is shared between humans (homo), macaca monkeys, mice (mus), rats (rattus), horses (equus), cows (bos), and dogs (canis). [[kellis-2014]]Kellis et.al. "Defining functional DNA elements in the human genome." PNAS. 2014 .Figures #1 and #2 show detected functional DNA by different methodologies. [[encode-2012]]The ENCODE Project Consortium. "An integrated encyclopedia of DNA elements in the human genome." Nature. 2012. [[parker-2011]]"New families of human regulatory RNA structures identified by comparative analysis of vertebrate genomes." Genome Research. 2011.See the diagrams of functional RNAs in figure 5. 66% of nucleotides are cross linked and thus at least that much has a specific sequence. [[birney-2012]]Birney, Ewan. "ENCODE: My own thoughts." Ewan's Blog. 2012. [[maurano-2012]]Maurano, Matthew T. "Supplementary Materials for Systematic Localization of Common Disease Associated Variation in Regulatory DNA." Science. 2012.See figure S1 for the pie chart of SNP locations. The study says "coding regions were defined by the CCDS Project (downloaded from the UCSC genome browser at http://hgdownload.cse.ucsc.edu/goldenPath/hg19/database/ccdsGene.txt.gz on March 5, 2011"
[[freedman-2011]]Freedman, Matthew L. "Principles for the post-GWAS functional characterization of cancer risk loci." Nature Genetics. 2011. See table 1 in the paper. Note that a pre-print version of this study listing Alvaro N.A. Monteiro as the lead author does not include the table. [[mattick-2009]]Mattick, John S. "The Genetic Signatures of Noncoding RNAs." PLOS Genetics. 2009. The author states: "Most variations in regulatory sequences produce relatively subtle phenotypic changes, in contrast to mutations in protein-coding sequences that frequently cause catastrophic component failure." [[rands-2014]]Rands, Chris M. et al. "8.2% of the Human Genome Is Constrained." PLOS Genetics. 2014. [[preuss-2012]]Preuss, Todd M. "Human brain evolution: From gene discovery to phenotype discovery." PNAS. 2012. [[axe-2004]]Axe, Doug. "Estimating the Prevalence of Protein Sequences Adopting Functional Enzyme Folds." J . Mol Biol. 2004. Doug Axe (an ID proponent) tested a protein with degraded function to see how many amino acids could be replaced: "about one in four random single-residue [amino acid] changes are functionally neutral. The proportion would be somewhat lower under conditions requiring a higher level of function." [[vallania-2009]]Vallania, Francesco et al. "Genome-wide discovery of functional transcription factor binding sites by comparative genomics: The case of Stat3 ." PNAS. 2009. [[white-2013]]White, Michael A. "Massively parallel in vivo enhancer assay reveals that highly local features determine the cis-regulatory function of ChIP-seq peaks." PNAS. 2013. The lead author summarizes the paper on his blog. (Archive.is). He also tweeted: "One of our Nature reviewers said this paper should not be published in any journal, ever." [[long-2016]]Qian, Long and Edo Kussel. "Genome-Wide Motif Statistics are Shaped by DNA Binding Proteins over Evolutionary Time Scales ." Physical Review X. 2016. [[callaway-2014]]Calloway, Ewen. "First synthetic yeast chromosome revealed." Nature News. 2014. [[noble-2012]]Noble, Dennis. "Physiology and Evolution." 2012. At 16:24. [[niu-2013]]Niu, Deng-ke. "Can ENCODE tell us how much junk DNA we carry in our genome? " Biochemical and Biophysical Research Communications. 2013. [[moran-2017]]Moran, Larry. "ENCODE workshop discusses function in 2015." Sandwalk Blog. 2017. [[everywhere-2013]]Reddit user west_of_everywhere. "Comment on How come there's a Amoeba with 200 times larger gene set than humans?" Reddit. 2013. [[bhattacharjee-2014]]Bhattacharjee, Yudhijit. "The Vigilante ." Science. 2014. [[s-2005]]S, Yi. "Genome size is negatively correlated with effective population size in ray-finned fish." Trends Genet. 2005. [[gregory-2008]]Gregory, T. Ryan. "Population size and genome size in fishes: a closer look ." Genome. 2008. [[mills-2007]]Mills. Ryan E et al. "Which transposable elements are active in the human genome?" Trends in Genetics. 2007. [[jacques-2013]]Jacques, Pierre-Étienne et al. "The Majority of Primate-Specific Regulatory Sequences Are Derived from Transposable Elements." PLOS Genetics. 2013. [[moran-2011]]Moran, Larry. "Junk & Jonathan: Part 6—Chapter 3." Sandwalk Blog. 2011. [[gibson-2011]]Gibson et al. "Can Purifying Natural Selection Preserve Biological Information?" World Scientific. 2011. [[ohno-1972]]Ohno, Susumu. "So much 'Junk' in our Genome." Brookhaven Symposia in Biology. 1972. [[moran-2013]]Moran, Larry. "Estimating the Human Mutation Rate: Direct Method ." Sandwalk Blog. 2013. [[dna-transcription-2010]]DNA Learning Center. "DNA Transcription (Basic)." YouTube. 2010. [[khaitan-2011]]Divya Khaitan et al. "The Melanoma‐Upregulated Long Noncoding RNA SPRY4-IT1 Modulates Apoptosis and Invasion." Molecular and Cellular Pathobiology. 2011. [[guttman-2010]]Mitchell Guttman et al. "lincRNAs act in the circuitry controlling pluripotency and differentiation." Nature. 2011. [[dinger-2009]]MArcel E. Dinger et al. "Pervasive transcription of the eukaryotic genome: functional indices and conceptual implications." Briefings in Functional Genomics. 2009. [[ng-2012]]Shi-Yan Ng et al. "Human long non‐coding RNAs promote pluripotency and neuronal differentiation by association with chromatin modifiers and transcription factors." EMBO. 2012. [[sunwoo-2009]]Hongjae Sunwoo et al. "MEN ε/β nuclear-retained non-coding RNAs are up-regulated upon muscle differentiation and are essential components of paraspeckles." Genome Research. 2009.